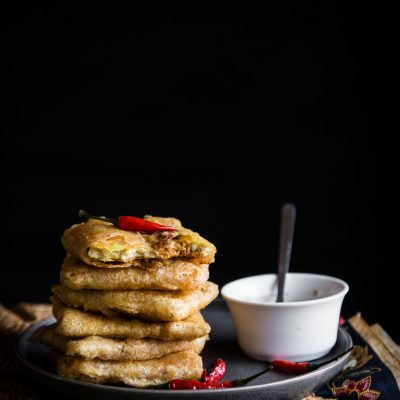 Tempeh Mendoan is thinly sliced and wide in size tempeh coated in spiced batter, deep fried and served with spicy sambal kecap. A snack recipe that is made to please. Vegan friendly. Preheat about 2 inches of oil in a deep pot for deep frying. While the oil is heating, mix all the ingredients for batter, except for ice cold water. Stir to mix everything. When the oil is hot and ready, pour in the ice cold water and whisk to mix, do not over stir. a little bit of lump is perfectly fine. Coat each slice of the thin tempeh with batter and carefully lower into the hot oil and let it fry until golden brown on one side and then use a tong to carefully flip to the other side. The idea is just to fry until the batter is crispy, but the tempeh inside isn't necessarily all crispy and dry. Remove from the oil into an absorbent paper towel. Repeat with the rest.